Lithocarpus orbicarpus is species of stone oak believed to be endemic to Thailand. Discovered by scientists for the first time in 2013, only one individual tree is known, located within the Ton Pariwat Wildlife Sanctuary. It is a medium to small tree and can be distinguished from other species by its spherical acorns covered with a dense pattern of irregularly placed scales. 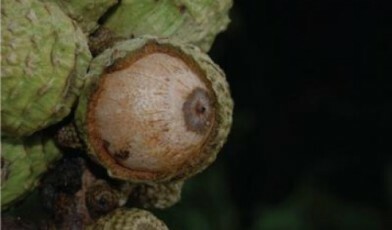 Its scales conceal the nut inside, except for a tiny opening at the top. As the species has only recently been discovered, very little is known about its biology, evolution or its position within the genus Lithocarpus (Fagaceae). Additional surveys are required to determine the actual population size within the sanctuary. So far, it seems that the species is not only endemic but also very rare within the sanctuary. It is also not clear whether the species is naturally very rare, or whether it occurred in a larger area before major clearing of the Thai-Malay Peninsular forests commenced. Its restricted range does however stress the conservation importance of the Ton Pariwat Wildlife Sanctuary for this new species and other flora and fauna present. Currently, more than 300 species of Stone Oak have been described, occurring from eastern India to Japan and the eastern tip of Papua New Guinea. The fieldwork conducted in Ton Pariwat Wildlife Sanctuary is part of ongoing research on the genomics, systematics, biogeography and evolution of tropical Asian Oaks and their close relatives. In 2014, additional fieldwork is planned in China, Thailand, Sabah, Brunei, and the Philippines.